Legal fees for estate administration are usually charged as a percentage of the estate's assets. Under certain circumstances, services may be charged on a hourly basis, as mutually agreed to in writing between the law firm and the client. The objective is to preserve as much of the family's assets as possible AND still be eligible to receive medical assistance (Medicaid) for existing, ongoing, or future long term care, no matter whether nursing home care or home health care. To achieve this objective, the following issues must be addressed to customize a family plan: - qualifying clients for Medicaid to preserve assets - asset transfers to spouse, children, others - saving your home - gifting to preserve wealth for future generations - strategies for married couples - annuities to maintain monthly living expenses - special needs Medicaid trusts - when & how to file the application - Medicaid estate recovery when applicant passes away - how to protect against or reduce liens for estate heirs. Estate planning comes down to protecting a family's financial resources in the here and now for the future. Estate administration comes down to preserving a family's financial resources after a loved one has passed away. Levine Law is committed to continued success in helping families from all walks of life with planning ahead today to pave the way for tomorrow. Brian Levine has a substantial amount of courtroom experience arguing cases in front of judges; public speaking experience with seminars to the general public and other attorneys; negotiation and settlement experience with 100s of real estate closings and family estates. He is noted for very calculated strategic planning with his clients to try to obtain the most favorable result in the most cost effective way. Levine Law, LLC is a 3rd generation law firm with over 75 years' experience representing both individuals and companies to obtain favorable results both in and out of the courtroom. Most smaller sized law firms have a generalized practice by nature, meaning that those firms handle any and all areas of practice, regardless of how educated or experience those firms are in those areas. This type of generalized practice makes it very difficult to keep up to date with the constantly changing laws and procedure in all of those practice areas. Levine Law is distinguished from many other solo practitioners and smaller sized firms because the law firm is not a generalized practice. Instead, the firm intentionally concentrates in very specific areas of the law in order to position itself on the cutting edge of research and important changes taking place in these areas of the law. Levine Law is further distinguished from other competing firms because the firm is able to offer specialized services in multiple different states, including OH, WV, NY, MI, and CA, through its affiliated relationships with highly experienced attorneys in these other states. Mr. Levine, a third-generation attorney, is a member of: Pennsylvania Bar Association -- Real Property Trust and Probate section; Lawrence County Bar Association; and Lawrence County Board of Arbitrators. Brian received his J.D. from West Virginia University College of Law, Morgantown, WV (2002-2005). His undergraduate studies were at the University of Michigan, Ann Arbor, MI (1998-2002). 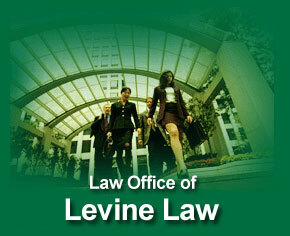 Mr. Levine is the owner of Levine Law as well as Levine & Levine Settlement Services, LLC and a partner in Vintage Settlement and Consulting Corporation, specializing in reverse mortgages. Brian has also gained experience as a Court-appointed criminal attorney for Lawrence County Pennsylvania Courts of Common Pleas where he has achieved multiple exceptional results for his criminal clients time and time again. Mr. Levine has also worked as: contract counsel for the California Law Offices of Steve Levy/Court Appearance Professionals; by conducting legal seminars for various nursing homes, businesses, and organizations located throughout PA; and through his expertise and experience, he is also teaching CLE (continuing legal education) classes to other attorneys throughout Pennsylvania concerning title insurance and all related business and legal matters to title and closings.